Winter melon, scientifically called Benincasa hispida, also is commonly called the wax gourd, the ash gourd, white gourd, and the winter gourd. Its seasonal name probably comes from the fact that while grown during the summer and autumn, it can be stored and eaten during the winter months. Mature winter melon has a very mild taste, while the immature fruit is sweet. Winter melon is a large fruit grown in warm climates that can grow beyond 1 foot long and weigh more than 40 pounds. It resembles a large watermelon with its oblong shape and dark-green, waxy skin. Unlike a watermelon, the inside of the flesh and seeds are white, it is tasteless, and it cannot be eaten raw. When it is immature, the outside of the fruit is fuzzy. Once it matures, it loses its hair and gets a waxy coating. Cubed or sliced, winter melon can be steamed, simmered, braised, or parboiled and added to stir-fries. Best used in soups, you can season this rather mild and bland melon with strong spices and herbs. Winter melon is suitable for pickling and can be diced and candied. Whole winter melons will keep in a cool place for months and likely up to one year. Winter melon absorbs the flavors of the ingredients it is cooked with. A famous Chinese dish is winter melon soup, where slices of the melon are simmered in a broth with Chinese dried mushrooms, ham, and seasonings. In a popular banquet version of the dish, winter melon serves as a cooking vessel, main ingredient, and the serving dish. The soup is steamed inside a whole winter melon and served that way at the table. Winter melon also is used in sweets, such as Chinese wife cake, also called sweetheart cake, and the Indian treat petha, a soft, translucent candy from Agra, and in curries. In the Philippines, it is candied and called kundol and used as a filling for bakpia, also known as hopia, which are sweet bean-filled mooncake pastries. Although winter melon is popular in China, it was originally grown in Egypt. It was introduced to Europe during the Renaissance. Today, this melon is cultivated throughout the world and grown in Europe, Asia, the Americas, and Australia. Winter melon can be found in most Asian supermarkets. 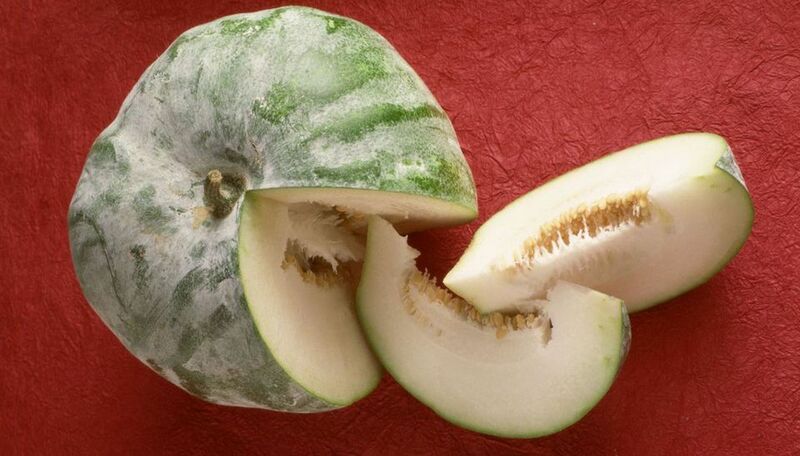 Whole winter melon might be available while in season, but it is easier to find cut pieces. The melon slices will last for a couple of days if placed in a plastic bag in the crisper section of the refrigerator. Winter melon is used in Chinese medicine as an herbal treatment for mild urinary tract problems. It is high in vitamin B and in dietary fiber. According to Chinese medicine, foods have a thermal property—warming, cooling, or neutral. Winter melon is considered to be a yin or cooling food. In addition to counteracting urinary problems, yin foods are a good balance against fever, swelling, high blood pressure, constipation, among other conditions.